I have a date with a two year old boy on a dirt pile. Two days ago, Ollie saw me through his fence and kept calling, "Nana Honey! Come and play with me on the dirt pile!" I was about to go to a band rehearsal, so I had to put him off. This evening, though, we must meet there and have our ritual play. 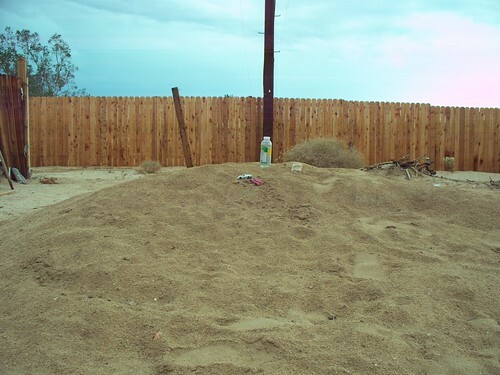 Damian made a modest pile of dirt in their back yard when he created their garden, long before Ollie was even born. I remember thinking that a child would love to play on it. 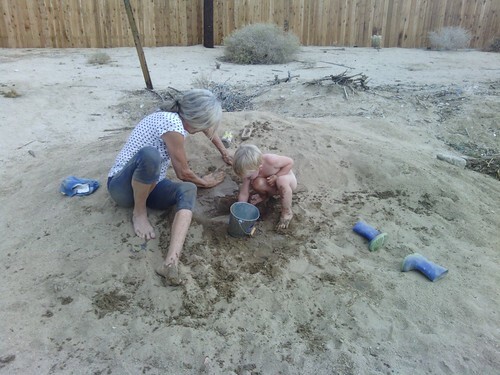 Years later, a child DOES love to play on it! And so do I. He and I throw rocks that we excavate. We throw dirt clods that disintegrate as soon as they hit the ground. We run our hands through the remaining dirt to see what we can find. 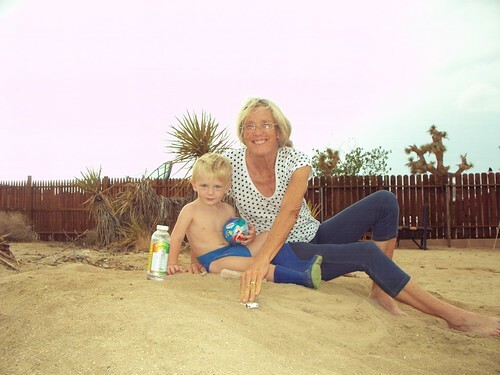 We wiggle our toes in the sand as it gradually becomes rock-free and softer. Ollie goes and gets water in his watering can and sprinkles the dirt around our feet, and we enjoy the feeling of the wet sand on our skin. Then we make roads for his matchbox cars. I'm sure there are other things to do on this pretty unremarkable pile of dirt, and with time we will probably find them all. The pile is definitely shrinking day by day as we rid it of its rocks and clods and pack it down by sitting on it and moving parts of it around with our excavations. After it is no longer a pile, we'll have to see about getting some reinforcement dirt. It would be great if we could make a mountain at least twice as high. I know a little boy who will soon want to ride his bike up and over it. In the meantime, we will keep whittling away at the one we have. It's perfectly adequate for now, and I'm grateful for this little natural treasure sitting just on the other side of our fence in Ollie's backyard. I wish I had a picture of us an hour later. We definitely needed a bath! Ollie kept bringing pailfuls of water to fill up the "swimming pool" we were digging, and we both got seriously muddy! Ollie was completely naked and splattered with mud. (Ever try throwing mud balls? It's really fun!) And my clothes were a totally different color, "dirt color", with plenty of mud caked under my fingernails. Had to get out the fingernail brush, scrub myself down in the shower, and throw my clothes in the washer. Ollie's bathwater no doubt will be brown tonight. That was too much fun! Meet you at the dirt pile next time, Ollie-boy! Ollie's going to love you even more when he's older and looks back at these pictures! So that looks like a new fence? Is Ollie's on the other side of that? That's the neighbor's fence. Our fence is out of the picture to the right.